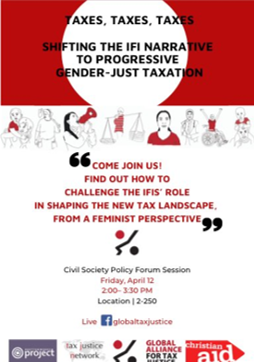 This Civil Society Policy Forum session was a product of the Tax and Gender Working Group of the Global Alliance for Tax Justice, and co-sponsored by Christian Aid, the Tax Justice Network and the Bretton Woods Project. The other aspect of my experience with IFIs is that there often is a long denial phase on new issues. Civil society organisations (CSOs) fight for a long time to get issues on the agenda, then they are added to the rhetoric of IFIs. Then for new issues to be integrated in policy coherence, that is another story. Finally about tax, generally we have to fight back the idea that it is just a tool for revenue collection. It is also a tool for redistribution. Tax policy should be completely linked with revenue leakage issues. And finally, because we are talking about a global phenomenon, on the issue of tax governance, cross-border taxes should also be considered. It is from those perspectives we want to address the issues of tax and gender in particular today, with a great panel to do so. Kathleen Lahey: I am here to pick up where Dereje left off and start with the general proposition: connecting gender and tax, which starts with the political economy of women. Globally, women perform 71.4 per cent of unpaid work, have 42.5 per cent of paid jobs, and share 43.2 per cent of market earnings. These unfair distributions mean women will always be at an unfair starting position in the economy. While this picture is slightly different in different countries, overall we still see these same trends across almost all countries. In Vietnam for instance, we see women perform 62 per cent of unpaid work, hold 49.4 per cent of paid jobs, and share 38 per cent of market earnings. At the lower end of the scale, in Timor-Leste, these figures are 57.6 per cent, 48.8 per cent and 24.3 per cent respectively, while in a high income country, paradoxically, it can actually get worse, like in Australia, where the same figures are 67.2 per cent, 34.1 per cent, and 36.8 per cent. One of the ways to look at how this happens, is to try to track where the money is. In Vietnam for instance, there is a close parallel between men and women on earnings and income throughout the life-cycle. Take that data and cross-cut it with the composition of the tax mix. Based on 2017 data of the World Bank, the key things to notice is the enormous rise in VAT rates and a significant lowering of corporate tax rates from 1990 to 2014. If you think of this VAT increase in addition to increases in social protection contributions, carbon taxes, which are also a flat consumption tax, as well as excises and fees, and sometimes informal taxes, what you have is a glowing glut of low-income targeted taxes. What does that mean for gender? My research in Timor-Leste shows that VAT burdens are highest on the poorest women, who make up 66 per cent of the lowest-income group. I looked at exemptions that were supposed to make the VAT neutral for poor people, bu they actually were ridiculously meaningless for the poorest. It means 65 per cent of the population is not able to afford the basic necessities of living. When the 2 dollars VAT are added to that, it means they cannot afford that much more. The highest incomes do not carrythat burden. If you replace that VAT with personal income tax, it would make an enormous difference in progressivity. The entire revenue amount raised would be increased by focusing just on a few people in the upper 9th and 10th deciles, and it would not be that much money out of their pockets. That amount was not going to break anybody in those upper deciles. When presented with evidence like this, the rush to put VAT increases in place was slowed down in that country, and other measures have been put in place, like social protection, that help mitigate some of these impacts. This is happening in rich countries as well, but it does not have such clearly devastating impacts relating to poverty, and ironically it can be harder to get the data for those countries. Matti Kohonen: Are these trends homemade? Where do they come from to be global trends? It is great to see the gendered impacts of tax policy in the way Kathleen just presented. We need to see that type of research more widely, including to be used here at the World Bank. Christian Aid works in over 30 countries. We see high levels of indebtedness in the countries we work in, which means there needs to be fiscal surpluses to pay off debt. That means that taxes need to be raised, and understanding that the economy often has not performed well, that often translated into a need for “quick wins”. The reason why VAT is pushed so much is that it is a quick way to raise income fast, you can change rates within a few months, that can plug in some of the gaps in the budget. That is why its popular. Other quick wins are fuel taxes, and there are also new taxes being invented like this, like in Zimbabwe on electronic transactions and bank levies. Its really important to start to look at impact assessments of those taxes, and many of those impacts are gendered as well. I mean that the IMF and World Bank should not just look at their impacts on low versus high income groups, but also how they can impact men and women significantly differently. Christian Aid Nigeria and Sussex University looked at market traders and how increasing taxation of the informal sector can target women in particular. This research looked at simplified market taxes, those are again indirect taxes not based on profits you make but that those you have pay to access the market space, and we found they disproportionately impact women, supporting what has already been presented by Kathleen. In this context we ask IMF staff here in particular, but also World Bank staff: How are you implementing Christine Lagarde’s words on gender being macro-critical in tax policy? What we hear when we present these considerations is push-back on gendered impacts of VAT, that as long as its revenues are spent well, it will be fine for women. Essentially, ignore how you collect it and assume it is spent well. Those assumptions should not be made, in particular with countries with high debt payments. I am really questioning whether the expenditure side is the way to solve it. We have to look at the tax side. We are increasingly relying on VAT. Why not rely more on PIT, as countries move to being middle-income countries in particular? On Bangladesh, which is moving to middle-income status and will need to mobilise more of its own revenues as concessional financing becomes less available, even very wealthy people are not registered in its income tax system. People who work in factories, etc, the bosses in those factories, need to be taxed. What makes income tax better is that we can have a threshold and can exclude the poorest. If we add a box on gender as well when they are filing their tax returns, we can distinguish between men and women and get that crucial data we need to measure the so-far mostly invisible gendered impacts. A lot of the IMF’s new research on gender is not being implemented in policy advice. The Tax Policy Assessment Framework (TPAF), a new tool for assessing tax policies by the Platform for Collaboration on Tax, can be a good starting point to include these issues, but if gender is not being included from the start in all the Fund’s tax policy advice we are missing a trick. We have the same conversations on social protection. 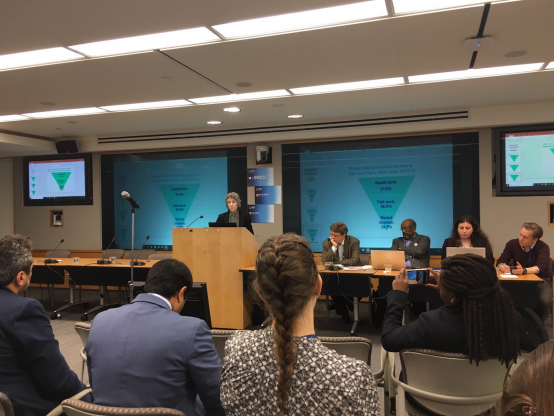 Why are we not talking more about the gendered dimensions of social protection, which would make the need clear for care work compensation and maternal health coverage in the ongoing social protection discussions at the IMF? We have also looked at the IFC and private sector lending. Many IFC loans and equity shares are rooted through tax havens or jurisdictions which have low rates and high secrecy. Because the IFC has a large impact through its investments, the IFC can do better and raise standards. The IFC has leverage here and the avoidance of tax reduces revenues needed for public services that, as we know, play such a crucial role in moving closer to gender equality and providing for women’s rights in particular (see Observer Autumn 2016) . Soren Ambrose: We have heard about a lot of problems the IMF can do more about, or, sometimes, perhaps actually should do less to improve things. The title of this session is a reference to the viral video of the Dutch historian at the World Economic Forum at Davos this year, making the point that raising taxes and the rich paying their fair share is more important for sustainable development than the various philanthropic initiatives showcased at Davos. This panel might similarly start to sound like VAT VAT VAT, but the reason is because that is where the IMF puts almost all of its focus. We think the IMF has been very responsible for pushing VAT so much around the world. ActionAid published “Short-Changed” last year, that focused on regressive impacts of VAT on women. The fact is that many developing countries depend on VAT for 25 to 30 per cent of their revenues, so its a hard trend to break in short order, but we want to at least moderate it with other types of taxes. We are also concerned about the ‘un-virtuous’ cycle between tax and public services. As Matti touched upon, countries that cannot raise revenue also end up not being able to fund public services. That in turn impacts women disproportionately, by cutting into their time and incomes more, restricting access to services and increasing their unpaid care burdens disproportionately. ActionAid has emphasised that VAT cannot be implemented fairly without paying more attention to zero ratings. The Fund is generally very opposed to that for products families depend on to survive. If your starting point is welfare and the survival of women however, it becomes so clear they just cannot pay taxes they do not have, as Kathleen evidenced in looking at the poorest women and their expenditures. Women are indeed also more concentrated in the informal sector, which also aggravates the gendered impacts of tax systems. We published a report during in February on these issues in Ghana. The emphasis is on the concern about inadequate tax collection on public services. While Ghana for a while has seen money go to poverty reduction activities, it has re-entered IMF programmes in a big way and then saw a huge drop in this spending since the IMF programmes as their conditions mandated. Since 2015, strict implementation of IMF wage freezes has created big problems for public services in Ghana. Nurses are sitting idle not working, teachers are not being replaced. In Ghana, tax problems include the fact that revenue growth is almost entirely made up from indirect taxes, almost entirely VAT and excise taxes. Aggravating the regressive impacts of that, is that Ghana has implemented a financial services tax, as advised by the IMF. The problem with that tax is that it only affects the customers, not the banks, and it therefore actually increases the problem of financial exclusion in Ghana, which, as we know, is an incredibly gendered issue. Just like in Kenya, Ghana has also had to implement fuel taxes, which again disproportionately hit women and the poor. In one more publication series on tax by ActionAid, we have published a series of progressive taxation briefings. They cover property tax, capital gains, informal sector taxes, excise taxes, wealth taxes, and talk about how to make indirect taxes like the VAT less regressive. These are living documents as we are continually revising them and would appreciate feedback. We hope they may be useful to these types of discussions going forward and we are adding on corporate and personal income taxes next. Serena Abi Khalil: I work at ANND, the Arab NGO Network for Development. We are about to publish new research that considers the issue of gendered impacts of tax policies in the region. While the findings in the MENA region are not so different from the global trends the panel discussed, we suffer particularly from pressure of IFIs, and so far there has been no research in this field in the region. We focused on four countries, Lebanon, Jordan, Egypt and Morocco. Within a period of 25 years, there have been almost no meaningful reconsiderations of the impacts of tax policies in these countries. Why is that the case? Because these countries have been under strong IMF influence. We looked at this from a regional perspective, even though we know these policies are different at the national level, because the conditionality imposed was non-tailored and region-wide in our view. That is the common thread. The best way from under IMF conditionality is to increase VAT. When we as a network decided to work on gender and tax with Christian Aid, it was hard for us to rely on data, as there is no gender dis-aggregated data in the region. Yet, our main findings firstly led us to differentiate between implicit and explicit bias in tax systems. Lebanon had the most explicit bias, with joint filings only carrying exemptions for men as main breadwinners, and with significant maternity leave discrepancies in the private and public sector. We also found explicit bias in the code of commerce, which explicitly differentiates between men and women in property ownership during bankruptcy. Egypt also shared the same bias in parental leave. In Tunisia, certain exemptions were also only offered to men. They did adopt a separate instead of joint filing system, which is usually good from a gender perspective, but only because women are severely paid less than men. The thing these countries have in common on implicit bias is the high VAT burden. Average annual household expenses on water, fuel and food is mostly bought by women. The study will show more by sector and region and will be published soon. There are recommendations to governments to adopt more progressive taxation, but also to the IMF to change its tax conditionality approach depending on specific country needs. We have even seen in post-conflict countries, with a very specific context, it is generally the same old policy package. Other ANND research into the tax systems in Lebanon, Egypt and Tunisia concluded that tax laws and policies reflect unequal gender norms and practices and often aggravate them, but that they can also be changed to mitigate gender inequality. For example, where VAT is regressive, the impact on women is generally greater than on men, not only because women are generally less wealthy, but also because in the Arab region women generally take care of a larger proportion of household expenditure so that increases in VAT impact on women disproportionately. Actions needed towards gender equality are clearly set out in the Convention on all forms of Discrimination Against Women (CEDAW) and the SDGs. Tax and fiscal policies must contribute more to financing the progressive realisation of women’s rights and the achievement of SDGs, ensuring public spending meets the needs of women living in poverty and other marginalised groups as a priority, and that tax policies raise revenues in a way that is progressive in relation to gender and other inequalities. Dereje Alemayehu: Thank you all for those presentations. To be clear to everyone. We are not talking about having a gender-specific tax policy. It is about regular taxes carrying gendered burdens. To the whole panel, what are the negatives to be eliminated and positives that need to be brought out? What are the things to be done at the level of IFIs and governments? Matti Kohonen: There is a lot to be done. Improvement of corporate tax systems and wealth taxes for instance. These are policy tools that need to be used. Tackle corporate tax evasion through transfer pricing. IMF has looked at that, they say spillovers are significant and that it adds up to tens of billions of dollars not going into public services. I really hope that we can start to build a corporate tax system that is fair and fit for purpose, that means taking the conversation away from here, in Washington DC at Spring Meetings, and take it to the UN at a bigger table, with more developing countries involved. We have suggested the UN should be involved in these discussions. That was proposed at the Addis Ababa 2015 conference by developing countries, but those in power were against it and so it did not go through. The existing UN tax group cannot set or change rules as it is not a political body. It should be therefore be upgraded. We have also seen the rate of reductions in corporate tax rates. We have gotten down to rates between 10 and 20 per cent. Twenty years ago these rates were between 30 and 40 per cent. We are all losing out to those who make the most money in the global economy. Serena Abi Khalil: At a national level we need to have gender dis-aggregated data and have studies of women’s consumption and tax burdens, and role in production. We need personal income tax design with poverty lines and inflation rates taken into account. We need to design tax policies that are in line with CEDAW and for those countries that have not yet, CEDAW needs to be ratified. Soren Ambrose: We need to build developing country capacity to deal with corporate tax collection. A lot is being lost to transfer pricing. They need to have capacity to go after that. Gender-friendly formulas of VAT include increased use of capital gains tax, or income tax that taxes capital gains, and the introduction of high-net wealth individual units in revenue authorities. It is a political challenge, because those in power are those with the money, but it has to be done to get countries to be self-sufficient. There have been recent improvement in property tax collection that have helped make things more efficient. Those should be scaled up. We would like to see trade taxes make a come back. There should be impact analysis on trade agreements on gender as well. The new at least rhetorical focus on wealth taxes is also a good thing. It is difficult to go after the wealthy, but it must be done and the conversation is increasing. We need to look where the money is, which is with the corporations and the wealthy. Kathleen Lahey: A good place to start is addressing the issue of joint taxation, as it helps go into two big barriers: 1. Getting rid of it would help us collect gender dis-aggregated data, we need to have that for better and more analysis. 2. If joint filings were eradicated in Canada, women’s annual income would go up with $3,000 on average, but almost double that in lower income groups. That would be a high priority. I think the progressive trade-offs for the VAT need to become second nature. I was very disappointed to see the first VAT TPAF module, which still holds up this perfectly ‘clean’ VAT as the golds standard. We need to go after the difficult process of trying to follow tax avoidance chains and gender exploitation chains that now encircle the globe. Special export zones also need to be resisted, as they are essentially tax havens on steroids that harm labour standards and turn people into labouring ants. The number of these are growing as we speak in all countries and feed through tax avoidance chains. That is part of the problem in countries like Bangladesh. We need to scour all the rules for evasion and avoidance. Another issue, which I consider a ‘sleeper’, is that corporate income tax is vanishing before our eyes, because it is silently being split from income. A counter legal fiction has been created to tell us it is a separate entity that has been created. These entities are not really seperated from the people who profit off them. It is this technical interface between corporate and human tax payers that is causing corporate tax to melt before our eyes. Personal income tax looks like its going up but corporate tax is going down much more at the same time. Jane Seruwagi Nalunga (SEATINI – African trade justice organisation): You mentioned bringing back trade taxes and using tax as a tool to bring growth to developing economies. I agree. Tax has to go beyond just revenue mobilisation. We have to use it as a tool to grow our economies. This is critical. I do not support protectionism, but it can be important to protect certain vulnerable sectors. Chris Morgan (KPMG): I have heard a lot of folks talking about corporate tax disappearing. While rates are going down, the OECD says that as share of total tax revenue, corporate tax income has gone up, from 12 to 13 per cent. There is a paradox there. Nobody knows why. A lot of what has been said is focused on poverty. Not necessarily on gender. Isn’t the issue poverty rather than gender? If you solve the first then the second will follow? Amanda Mukwashi (Christian Aid): You mentioned that we need to build the capacity of developing countries. I am keen to understand what that looks like. I have been talking to colleagues from developing countries. It seems too complex to solve at the national level. The solution needs to come from the global level. On tax dodging, the issue is, when you look at how it is being done, it is not just a tax issue, it is really an exploitation issue. On the earlier question from the KPMG colleague, unfortunately the people that are at the bottom of the economic pyramid are women. It is not just a tax conversation, but this conversation crystalises the double unfair impact of gender and the economy. My questions are: What does the capacity building you mentioned look like? When you talk about a UN Tax Body, what is the resistance from the global community? Who is being protected by the current system? Is it time we upped the tempo of global tax system reform, as women are bearing the brunt of the system. Sargon Nissan (Financial Transparency Coalition): You mentioned briefly in the MENA presentation an interesting issue of energy subsidy cuts in the region, which obviously has big gendered implications because men and women use different types of fuel, which raises the question of rentierism in the region. In trying to connect this big picture to women’s daily lives, lets be propositional between the big picture and people’s every day lives and how can we best do that? Matti Kohonen: On the KPMG question, poverty is gendered, fundamentally. For women to participate in the labour market, you need to take away care burdens, address social norms, provide child care. All of that requires public expenditure, social protection, maternity pay, that enable women to enter and get a rise in salary. There are thus budgetary reasons why women are not in the workplace. That is why taxes need to be raised from a gender perspective, but if those tax burdens are unequal, women are being double burdened. On the question about the barriers to a UN Tax Body, even in the Financing for Development Forum, the G77 of developing countries did request it again, yet a consensus was not reached. Why? Because it is about losing control by the richest countries over how the rules are made. It raises important questions like, does that mean we do not trust each other and are not equal? They need to work together on the problem of transnational corporations being taxed together. We have talked a lot about the ABC of taxes, including a public registry, beneficial ownership, and country by country reporting. It also needs to be brought out more in public discourse. We are working with the EU parliament, that helps make this a more public issue. Once you have the ABC, you can have a real discussion about who pays what and who should pay what. Serena Abi Khalil: About rentier states, I was specifically talking about Gulf countries. They are trying to create this model out of concentrated wealthy economies. For Egypt, there were studies in the energy sector on gender dis-aggregated data, based on South Africa, because the problem with Egypt is that there is no access to information. Soren Ambrose: In terms of how to raise country capacity, it is a conundrum we have been facing for a long time. We have OECD tax inspectors without borders, but there are always suspicions about that because who they are. I think for countries to be able to develop their own approaches, they need to fund their own development. The presence of regional economic communities should be one way to go about doing this. The African Union has set expectations to develop capacity on tax, but have limited capacity to enforce that. So if we can move it down closer to regional economic communities and get countries to finance their own regional communities, that would help. Another would be to fund the South Centre. They have an excellent tax programme, but are underfunded. Also the African Tax Administrators Forum is really helpful in this regard. All of these are underfunded. Its up to developing countries authorities to fund these and would pay huge dividends if they did so. Kathleen Lahey: To address the question on corporate tax, last time I looked, the 100 richest economies in the world, 70 per cent of them were corporations. The 10th richest economy in the world is already a corporation. It is actually a sad comment to say that even though corporate tax rates are going down, their income is going up. That shows you how unbalanced the situation is that we are in. What we should be asking is why not collect at more traditional rates and see where that takes us and right the balance quickly. On the KPMG question, how do you connect gender to taxation without going into political economy issues? If you look at indicators for economic gender equality, issues like pay equity, full time employment, etc, no one country is able to get all of these rights. Countries have not yet developed an integrated method to address all of these together. That is reflected in how tax burdens fall across society. Yet, all countries that have signed up to the UN conventions mentioned are obligated to conduct gender budgeting on all levels. It is amazing how easy it is to demonstrate how almost anything in a budget will have a negative gender impact. It is not something that needs more understanding, it needs more respect and resourcing. Dereje Alemayehu: Thank you all for your comments and questions. I will close with a personal reflection of mine. For a very long time now, it has been a well-told story in development that if you go to a village in Africa, and ask where to dig a water-hole, the gender aspect of the location is the first thing that comes up, because men and women have different needs and daily experiences. So, for IFIs to say they have never considered tax and gender is ridiculous. If we see tax dodging rising and regressive taxing rising across the world, we know there must be more going on than just governments on their own making this happen. We need to hold governments, as well as IFIs to account for these trends, not just for sustainable development and equality in gender, but also for gender equality and women’s rights in particular.